All About Photo: How did your idea for your trilogy of books come about? How did it become a reality? Can you tell us about the evolution of the work as well as the ultimate creation of the books, On This Earth, A Shadow Falls, and Across the Ravaged Land? Nick Brandt: "At the beginning, even though I knew this extraordinary natural world was disappearing, I photographed it as a kind of paradise, albeit tinged with a melancholy. In fairly short order, I saw the escalating speed of destruction, and wanted to address that more directly. It reached a point where it felt somehow irresponsible to take photographs that only showed beauty, and didn’t convey the significance and impact of the loss. So On This Earth was kind of the honeymoon period; A Shadow Falls, as the title implies, began to show, through the progression of images, a transitions from a verdant world of plenty to a stark, denuded world of only a few lone animals; and Across The Ravaged Land showed man's destructive influence directly for the first time, with images such as the rangers holding tusks of elephants killed at the hands of man." All About Photo: When and where did you get the idea for the work in Inherit the Dust? Nick Brandt: "I grew up in England, home of the elk and brown bear, of the wolverine and cave lion, of the woolly mammoth and woolly rhinoceros. Of course, this was before my time. For each of us, wherever we live on the planet, animals such as these walked in the very place where we now sit. But of course, most of these animals are long gone. Meanwhile in parts of present-day Africa, albeit fewer parts by the day, even more extraordinary animals DO still roam. But the destruction of these animals, of these places, is not happening in the past, but in our own immediate present. We are living through the antithesis of genesis right now. It took billions of years to reach a place of such wondrous diversity, and then in just a few shockingly short years, an infinitesimal pinprick of time, to annihilate that. However, most of us still think that the destruction in Africa is to do with poaching, feeding the insatiable demand for animal parts from the Far East. Actually, it's much more complex and monumental than that. Mainly, it's about us. Significantly, it's about the terrifying number of us, and the impact of the very finite amount of space and resources for so many humans." All About Photo: Can you describe the process by which you made the images, as I imagine many people don't know. Nick Brandt: "I conceived the project in early 2014. Unreleased portraits of animals that I had taken over prior years were printed life-size and glued to large panels. The panels were then placed in locations where animals such as these used to roam but, as a result of human impact, no longer do. In all but a few of the final photographs, the animals within the panels are effectively invisible to the people going about their lives. The animals have been reduced to ghosts in these blasted landscapes. The damnation of animal life, the debasement of human life, the destructive conjugality between the two: It is not just the animals who are the victims of environmental devastation, but also the humans now inhabiting these landscapes. It's a cliché, but we must act urgently. If we continue to do nothing, future generations will be inheriting the sad remnants of a once-vibrant living planet. They will be inheriting dust." All About Photo: What challenges did you face trying to get this work out into the larger world? Nick Brandt: "In this day and age, there is so much out there, so much noise to compete with, that it can be very frustrating. Inherit the Dust has had a lot of publicity, but I would still want there to be much more, and in-depth, to influence people in how they view what we are doing to the world. Also, viewing this work online is a crap venue for it. The prints are are 7-10 feet long, and need to be seen at that size. There is so much 'story' you can't make out on your computer screen." All About Photo: I saw the current exhibition of Inherit the Dust at Fotografiska in Stockholm, Sweden (ending September 11, 2016). It is a beautiful exhibit and I found myself moved to tears multiple times while viewing it. Can you tell us about putting together this show? Is it the ultimate realization for the work or do you have other ideas for installation and exhibition? Nick Brandt: "I was delighted that Fotografiska, the wonderful museum in Stockholm, jumped to plan a show of the work almost immediately upon release (it's running until Sept 11). They really have put on the best show possible of the work - showcasing the entire series of panoramas in their best, largest size." All About Photo: Is Inherit the Dust going to travel to other countries, other museums so that it can reach a wider audience? Has it been shown in other incarnations in other places previously? 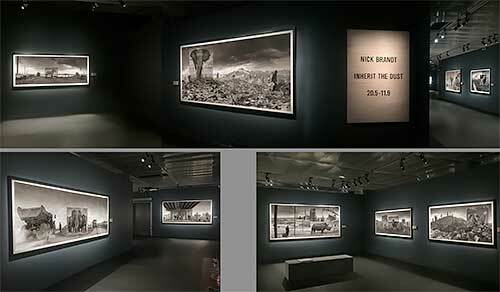 Nick Brandt: "There have been and continue to be exhibitions at commercial galleries in Europe, the US, and Australia. But due to limited space and reach to audience, these are not the best of venues. Museum shows check all the boxes. The Multimedia Museum of Art in Moscow will be next, next May. But there needs to be a whole lot more. The trouble is the museum world moves more slowly than the destruction of the natural world. I don't want to be exhibiting this work when it's too late and the animals and ecosystems have already been wiped out." All About Photo: Do you still shoot film? Why and what is it that makes film different from digital? Nick Brandt: "Yes, I still shoot film. In 2011, the temptation to live an easier life - both practically and emotionally - finally seduced me. Frustrated by the number of shots I was losing shooting with film, I brought a Hasselblad 60mp medium format digital camera to Africa with me. I took photos side by side with my film camera. The digital camera's images were sharper. They had more detail in both the shadows and the highlights. The digital camera made photographing very, very easy. And I hated it. For me, the images were too clinical, too sterile, too devoid of atmosphere. Just too... perfect. In fact, had I photographed using a digital camera from the beginning, I'm not sure that I would have liked a single photograph that I had ever taken. So in spite of all the considerable extra expense and aggravation and major technical compromises, I covet the glorious surprises that are sometimes achieved by the magical interaction of light and film negative. So as long as there is film available to buy, and airport security people that can be gently persuaded to hand check the precious vulnerable exposed rolls, I will continue to photograph with film. And I'll continue to lose endless shots along the way. So be it." All About Photo: Can you tell us about current projects you are working on? Nick Brandt: "Not sure. I'm having my first break since I switched to photography. It will always deal with the destruction of the natural world and with animals, but each time, I hope with a new perspective that inspires me." All About Photo: What drives you to do this work? 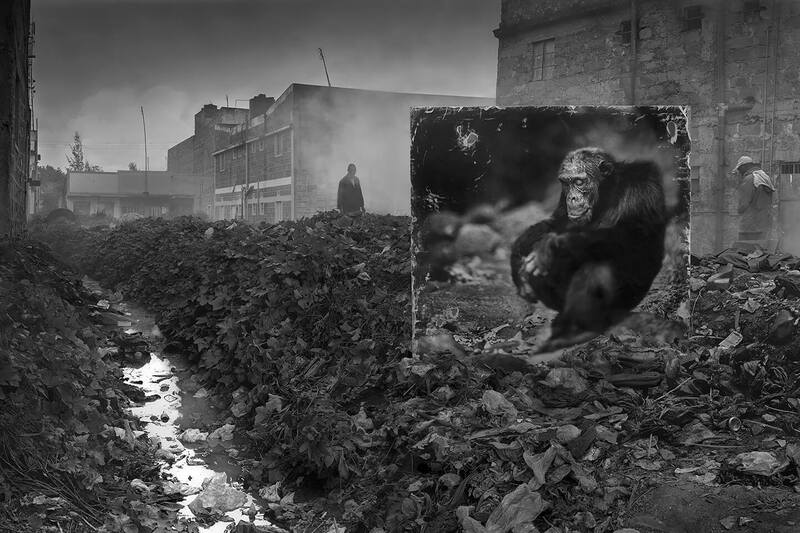 Nick Brandt: "Quite simply, the devastating, heart-breaking destruction of the natural world and the animals that live there. And the disastrous consequences for all of us." All About Photo: Can you tell us about your background and the origins of your interest in photography? What path did you take to becoming a successful photographer? Nick Brandt: "The animals came first. Not the photography, but the animals. Or to elaborate, my love of animals came first. Photography was merely the best medium to convey my love of, and fascination with them. From the outset, in 2001, I had a vision in mind: I wanted to create an elegy, a likely last testament to an extraordinary, beautiful natural world and its denizens that is rapidly disappearing before our eyes. I wanted to show these animals as individual spirits, sentient creatures equally as worthy of life as us. I had always wanted to express my feelings about animals and the natural world through what I created. But had never seen a way to achieve that until I visited East Africa and fell in love with the place." All About Photo: Have you ever worked as a commercial photographer or editorial photographer? Nick Brandt: "No. I have been very fortunate that I have never needed to, due to the sales of the limited edition prints. This is also just as well as a) I would not be artistically good at any kind of assignment, and b) if something is not working, I want to be free to walk away from it without feeling responsible to anyone." All About Photo: What advice to you have for emerging photographers? Nick Brandt: "Photograph only for yourself, never to please others. Don't second guess. Stay true to your own vision of the world."